This lovely hand-made modern home in the woods, lined with windows, flooded with light, has 2 bedrooms and 2 full baths, and a large wraparound deck facing a feisty stream. 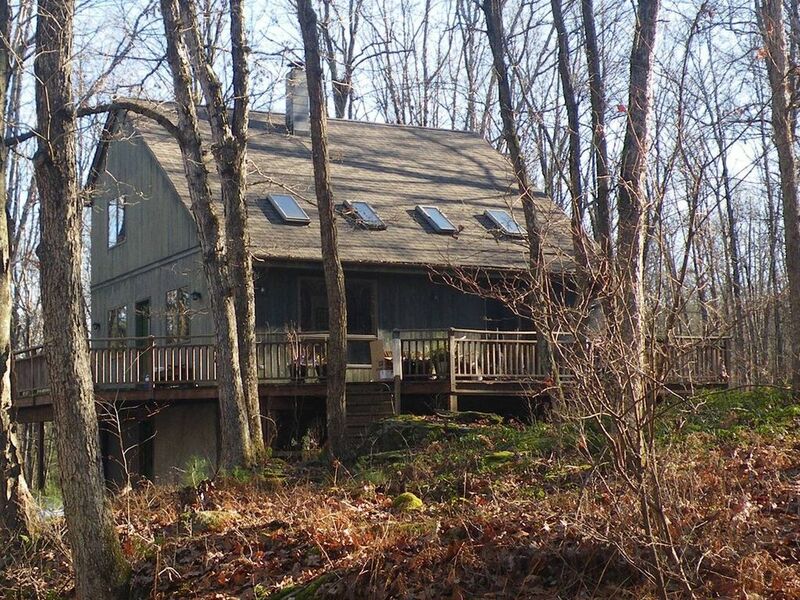 It has 10 beautiful acres of woods to wander, and no neighbors in sight for acres beyond. Enjoy its large inspiring kitchen and lofty spaces stocked with albums, movies, books, art supplies, and instruments. 5-10 minute drive to the outdoor adventures on the Delaware River and Sullivan county's hot spots including Narrowsburg, Callicoon, Bethel, White Lake, Skinners Falls, Bethel Woods Arts Center, gambling in Monticello and so much more. Enjoy antiquing, fishing, hunting, rafting, gambling, skiing, farmers markets - or do nothing but relax on the deck and wander in our delightful woods with a stream that never ceases to delight. I am a filmmaker, story consultant and entrepreneur based in New York CIty. I was introduced to this area by a friend from college whose family owns nearby, and I fell in love visiting through the 90s. I eventually bought a home built by hand by a friend of that family. Nicely designed, clean and well stocked with towels, bath supplies and an emergency kit. Set on a 10-acre property in the midst of hundreds of acres of mostly undeveloped woods. A stream crosses the property. Many local farms and farmers markets nearby. Minutes from the Delaware River. 5 minute drive to Skinners Falls and the Delaware River with tubing, kayaks, rafts, canoes, fishing and hiking. Premiere fly fishing location. A beautiful little stream crosses the property, tumbling downhill over rocks. Large living room with large comfy couch and recliner, side tables, coffee table. We try to stock the basics for cooking: oil, salt, pepper, spices, sugar, soy sauce and more. None of these are guaranteed, but just know you can count on some range of items like this. There is a large dining area in the open downstairs living area featuring a large dining room table made of antique barn wood (by the same man who built his house himself). A Bose speaker with mini input for all of your digital music players, and there is also a record player. Wide variety of art and picture books, non-fiction, kid's books, comics, graphic novels ands self-help. In addition to the large downstairs living and dining area, there is a large upstairs loft with a TV, DVD and VHS players, and huge shelf of entertainment ranging from movies to art and picture books, comics, graphic novels, poetry, kid's book and other fun novelties. There are also art supplies and board games. The house comes with a guitar and an array of instruments for late night jam sessions - no neighbors to complain! There is also a record player and an excellent vintage vinyl collection with a wide range of genres from decades spanning the 20th century. The Kitchen is well stocked for cooking and features a stove, oven, microwave, toaster oven and ice cream maker. There are deck chairs and a grill to maximize enjoyment of the huge wraparound deck, from which you will see the woods and hear the stream just a short stroll away up the path that was once an old quarry road.